1 A None No Power Seat 1 A is a standard Economy Class seat located at the bulkhead. There is no floor storage for use during takeoff and landing. The tray table is in the armrest making the armrest immovable, therefore, slightly reducing seat width. The proximity to the lavatory and galley might be bothersome. 1 B None No Power Seat 1 B is a standard Economy Class seat located at the bulkhead. There is no floor storage for use during takeoff and landing. The tray table is in the armrest making the armrest immovable, therefore, slightly reducing seat width. The proximity to the lavatory and galley might be bothersome. 1 C None No Power Seat 1 C is a standard Economy Class seat located at the bulkhead. There is no floor storage for use during takeoff and landing. The tray table is in the armrest making the armrest immovable, therefore, slightly reducing seat width. The proximity to the lavatory and galley might be bothersome. 1 D None No Power Seat 1 D is a standard Economy Class seat located at the bulkhead. There is no floor storage for use during takeoff and landing. The tray table is in the armrest making the armrest immovable, therefore, slightly reducing seat width. The proximity to the lavatory and galley might be bothersome. 1 E None No Power Seat 1 E is a standard Economy Class seat located at the bulkhead. There is no floor storage for use during takeoff and landing. The tray table is in the armrest making the armrest immovable, therefore, slightly reducing seat width. The proximity to the lavatory and galley might be bothersome. 1 F None No Power Seat 1 F is a standard Economy Class seat located at the bulkhead. There is no floor storage for use during takeoff and landing. The tray table is in the armrest making the armrest immovable, therefore, slightly reducing seat width. The proximity to the lavatory and galley might be bothersome. 10 A None No Power Seat 10 A is a standard Economy Class seat located at the Exit Row. There is extra legroom, however, the seat recline might be limited due to the other Exit Row behind. 10 B None No Power Seat 10 B is a standard Economy Class seat located at the Exit Row. There is extra legroom, however, the seat recline might be limited due to the other Exit Row behind. 10 C None No Power Seat 10 C is a standard Economy Class seat located at the Exit Row. There is extra legroom, however, the seat recline might be limited due to the other Exit Row behind. 10 D None No Power Seat 10 D is a standard Economy Class seat located at the Exit Row. There is extra legroom, however, the seat recline might be limited due to the other Exit Row behind. 10 E None No Power Seat 10 E is a standard Economy Class seat located at the Exit Row. There is extra legroom, however, the seat recline might be limited due to the other Exit Row behind. 10 F None No Power Seat 10 F is a standard Economy Class seat located at the Exit Row. There is extra legroom, however, the seat recline might be limited due to the other Exit Row behind. 11 A None No Power Seat 11 A is a standard Economy Class seat located at an Exit Row. This seat features extra legroom. 11 B None No Power Seat 11 B is a standard Economy Class seat located at an Exit Row. This seat features extra legroom. 11 C None No Power Seat 11 C is a standard Economy Class seat located at an Exit Row. This seat features extra legroom. 11 D None No Power Seat 11 D is a standard Economy Class seat located at an Exit Row. This seat features extra legroom. 11 E None No Power Seat 11 E is a standard Economy Class seat located at an Exit Row. This seat features extra legroom. 11 F None No Power Seat 11 F is a standard Economy Class seat located at an Exit Row. This seat features extra legroom. 26 A None No Power Seat 26 A is a standard Economy Class seat located in the last row of the aircraft. This seat might have limited recline. The proximity to the lavatories and galley might be bothersome. 26 B None No Power Seat 26 B is a standard Economy Class seat located in the last row of the aircraft. This seat might have limited recline. The proximity to the lavatories and galley might be bothersome. 26 C None No Power Seat 26 C is a standard Economy Class seat located in the last row of the aircraft. This seat might have limited recline. The proximity to the lavatories and galley might be bothersome. 26 D None No Power Seat 26 D is a standard Economy Class seat located in the last row of the aircraft. This seat might have limited recline. The proximity to the lavatories and galley might be bothersome. 26 E None No Power Seat 26 E is a standard Economy Class seat located in the last row of the aircraft. This seat might have limited recline. The proximity to the lavatories and galley might be bothersome. 26 F None No Power Seat 26 F is a standard Economy Class seat located in the last row of the aircraft. This seat might have limited recline. The proximity to the lavatories and galley might be bothersome. 9 A None No Power Seat 9 A is a standard Economy Class seat located just ahead of the Exit Row, therefore, seat recline might be limited. 9 B None No Power Seat 9 B is a standard Economy Class seat located just ahead of the Exit Row, therefore, seat recline might be limited. 9 C None No Power Seat 9 C is a standard Economy Class seat located just ahead of the Exit Row, therefore, seat recline might be limited. 9 D None No Power Seat 9 D is a standard Economy Class seat located just ahead of the Exit Row, therefore, seat recline might be limited. 9 E None No Power Seat 9 E is a standard Economy Class seat located just ahead of the Exit Row, therefore, seat recline might be limited. 9 F None No Power Seat 9 F is a standard Economy Class seat located just ahead of the Exit Row, therefore, seat recline might be limited. 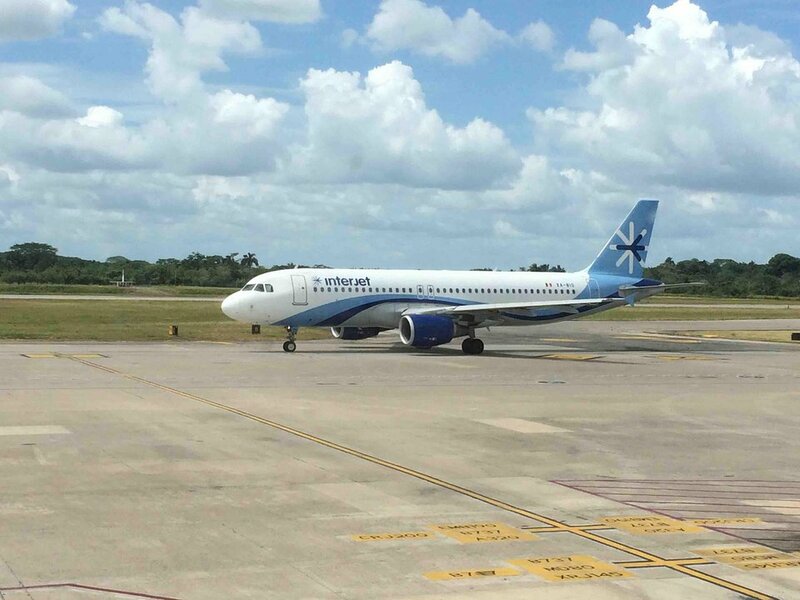 Interjet operates its A320 aircraft on main flights inside and outside of Mexico. Interjet's A320's accommodate 150 passengers in Most Comfortable Space service, this aircraft might accommodate up to 180 passengers. Most Comfortable Space features 34 inches legroom space between seats with no additional cost. Interjet is an incredible airline for service from JFK to Mexico City. they have removed 30 seats to create extra legroom for all seats--at no extra charge. Seats are comfortable. They lack individual flight entertainment but do broadcast a movie over speakers--so bring your ear plugs if you don't want to hear. Great snack service offered free sandwich, chips and beverage as well as free alcohol. They also have a dedicated bathroom in back for female passengers exclusive use. 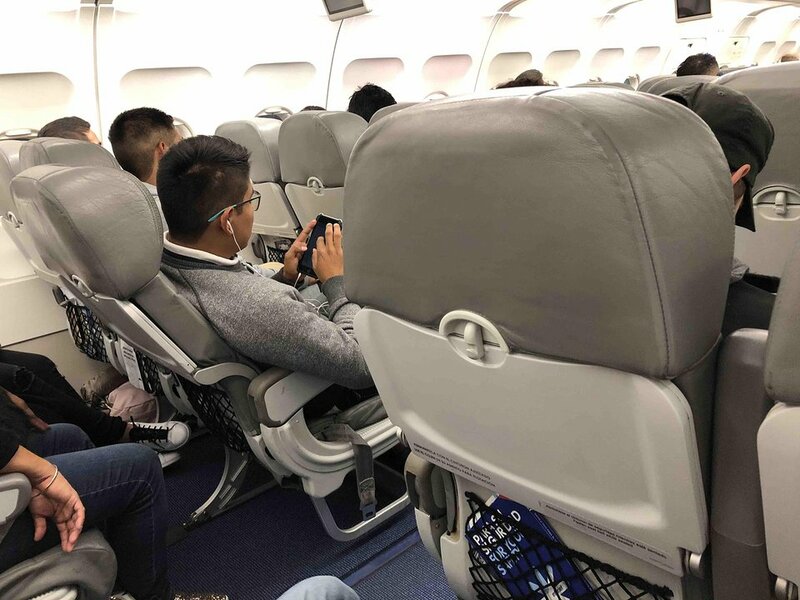 InterJet Flights seems to be the best , the other airlines Do Not compare , InterJet has the best space between the seats, stewards are really friendly. Overall The Best Airline to travel to Mexico. Interjet is totally the best airline in Mexico. Awesome leg space, great seat confort, great food service and great costumer service. The only thing Interjet doesn't have is in-flight entertainment. Seat comfort was ok, but the legroom was awesome (I'm 5'10). Free snacks and drinks, and even alcohol was free. Flight attendants were very friendly. Overall experience was very good on JFK to Mexico City. A comfortable seat for the flight from Mexico City to San José, Costa Rica, with the benefit of being able to see out the window and the wing not blocking it too badly. Flight attendants were pleasant. Snack service was a choice of Quaker oat biscuits (apple cinnamon) or a breakfast bar (strawberry). As I recall flight was about half to 2/3 full. Interjet is the worst airline in Mexico. Flight got delayed because of weather for no reason, while the sky was all clear in Monterrey and in Cancun. Flight attendants are rude and pilots make very hard landings. Airport service is terrible and so is onboard service. Seats are very uncomfortable, are very hard and all gray colored seats. Some planes have overhead screens which dont work. On my flight they were going to play safety demo on screens but they didnt work so flight attendants were angry because they had to do it themselves. Their motto shouldnt be "Always thinking of you" because its not true. They never think about their customer service, etc. They should be ashame of themselves. InterJet flies 1 versions of A320-200.